Faculty/staff surface permits may park in faculty/staff surface lots only from 7 A.M. to 2:30 P.M. (M-F). “Night Only” surface permits may park after 2:30 P.M.
*All Church events supersede UNO parking and must be avoided when event signage is in place. After 5 P.M., all valid permits can park in general use stalls in all garages and in faculty/staff and student surface lots. Students surface permits may park in student lots only from 7 A.M. to 2:30 P.M. (M-F). “Night Only” surface permits may park after 2:30 P.M.
Resident (housing) permits are not considered student permits. Resident information is in the next section. *All Church events supersede UNO parking and must be avoided when event signage is in place. ALSO NOTE, the U-Shaped lot south of the church is not for UNO parking until after 9:30am. Stalls designated for Church or stated No UNO Parking are considered a reserved stall. Graduate Teaching Assistants may purchase student or faculty/staff permits, and must follow the appropriate rules of the purchased permit. Scott Residents parking on campus must purchase a valid Scott Resident surface permit for Lots 10-13 or a Scott Garage permit based on your resident location. Scott Resident permits are restricted to their specific permit lots ONLY, 7 A.M. to 5 P.M. (M-Th) and 7 A.M. to 2:30 P.M. (F). The permit fee is not included in housing costs, this is a separate fee. Entry to Lots 10-13 requires access on a MAVCARD. Scott Management should be contacted to obtain access. University or Maverick Village Residents parking on campus must purchase a valid resident permit for the West Garage / Lot L. Permits are restricted to these lots between 7 A.M. to 5 P.M. (M-Th) and 7 A.M. to 2:30 P.M.(F). The University may close specific lots to permit holders due to inclement weather conditions or to designate parking lot use for special events. Event requests must be made 48 hours before the event to ensure parking options. Contact unoeventparking@unomaha.edu with event parking questions or to schedule parking for an event. Garage permits are only valid in the assigned garage on the respective campus from 7 A.M. to 5 P.M. After 5 P.M. (M-F), garage permits are also valid on faculty/staff and student surface lots or the other garages. Information on Daily/Hour parking options found on the Permits page. Faculty/Staff access Lots U (middle level) and T (lower level). 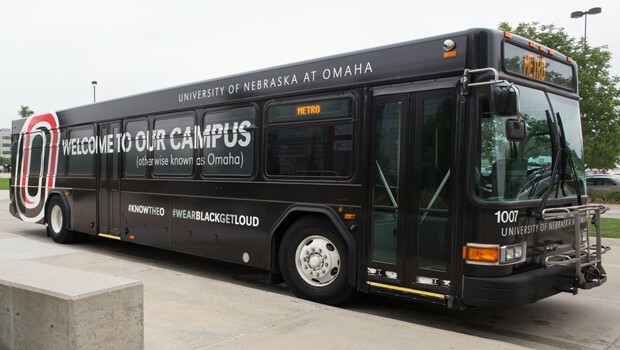 Student access Lots V (upper level) and T.
“Night Only” permits valid after 2:30 P.M.
After 12:30 P.M. all levels are available for hourly parking with the Park Omaha App for $1-$4. Lot T available for $5 all day during the 3-16 weeks of fall/spring semesters by paying at the kiosk. Kiosk Parking is only in Lot T, not the other E. Garage levels. Motorcycle parking available on all levels. NO ONLINE OR APP DAILY/HOURLY PERMITS are valid in this garage until after 12:30 P.M.
"Night Only" permits valid after 2:30 P.M.
Handicap parking available on all levels. Motorcycle parking available inside the South Entrance. Fac/Staff permits for this garage can also park in the West Garage. Students can only park in this garage with the Pacific St. Garage permit before 5 P.M.
Daily/hourly permits available online OR with kiosk or Park Omaha app purchase once parked. Current faculty, staff and students can ride Metro bus routes for free with their MavCard.